Just a quick post to let you know I've entered a bird phase. Weird. I always got a little smirk when I heard the term birder. I'm not one, by the way. More of an admirer. 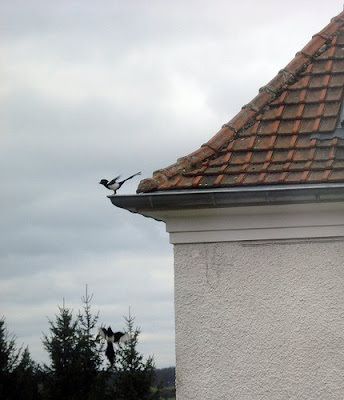 It started with these magpies that fly around our house. At the time I didn't know they were magpies. I only noticed they were different and beautiful compared to the crows I used to seeing out my Seattle window. Now I can't stop looking at birds. 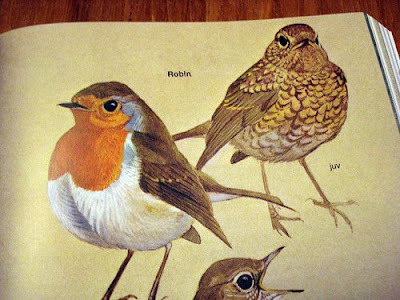 For Christmas I requested a book on European birds. Santa came through. We keep the book on the kitchen table. Audrey calls it mine owl book. Identifying them is harder than it seems - especially for a person (me) who has no working short term memory. Maybe it had a white stripe. Maybe it's tail feather was off to the side. Hmmm.... is small and cute in the description? Here are the birds I've been able to identify (I think!) so far . . . Does anyone have any tips of identifying birds? Not that I'm a birder. I'm just sorta curious. 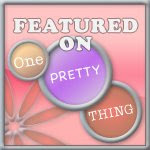 A few more hours to join the Charm Quilt Scrap Exchange. We're up to 24. Whenever we are hiking in the spring we seem to run into tons of birders. All I know is that it requires oodles of patience, but it is fun! And to always keep a camera at your side! Happy birding! We had magpies growing up in Eastern Washington. Amazing that they're everywhere! Years ago when my dad had cancer and had to stay at home for six weeks, we started birding. I always enjoyed it but don't often see a lot of new birds that I haven't identified. Go get the green book (maybe by the audubon society) best one out there. ha ha.. magpies are hated in Australia.. because in Spring their brains swell and they peck at anything with a 100 metre radius of their tree!! to protect their babies....so kids are so scared when walking to school, or through parks.. it only last for about 2 months and then they don't peck anymore.. but when they swoop you... arrrrrrr it is so scarey!! I have the same problem. By the time I start looking through my field guide to try and identify a new bird, they ALL start to look like the bird I just saw out my window. Unless I can snap a picture, I'm lost. We are novice birders and it's a wonderful hobby with kids. It keeps them focusing on nature instead of advertisements! With your first glance, always try to capture the legs, beak and size to memory. This will help you the most when you're stuck between 2-3 birds that it "could have been". Have fun! I love birds and call myself a birder but only silently to myself! You might like to look at this series of postings - a lot of bird love going around! I am also a secret birder. Binoculars are awesome for finding the singer of that odd song coming from a few trees away. 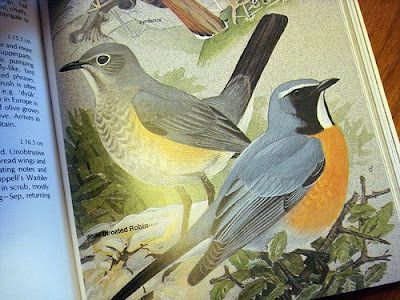 I try to find one detail that I am positive of and then go through my Stokes Field Guide to Birds. Not too much variety in the city, but I did have a rose-breasted grosbeak and a ring-necked dove last spring. Still can't tell the difference between a purple finch and a house finch! We love watching birds. There is something so peaceful about watching them.